I had the opportunity to see the BMW Art Cars at the Auckland Museum and they were amazing. Beautiful works of art that go very fast. The 3.0 CSL was the car that I really enjoyed and even got down on my hands and knee's to look under its skirts. It didn't disappoint. Under the bonnet is a 3.2L straight six engine with a very large turbocharger that produced 750bhp in race tune. Very cool to get so up close and personal to an amazing car. It was was entered into the 1976 Le Mans by BMW and driven by Brian Redman and Peter Gregg. After qualifying 8th it didn't do so great in the race as it had to be retired at the four hour mark with an oil leak. It was entered into a 6 hour race later in the year but after qualifying on pole retired after 33 laps with drive train failure. 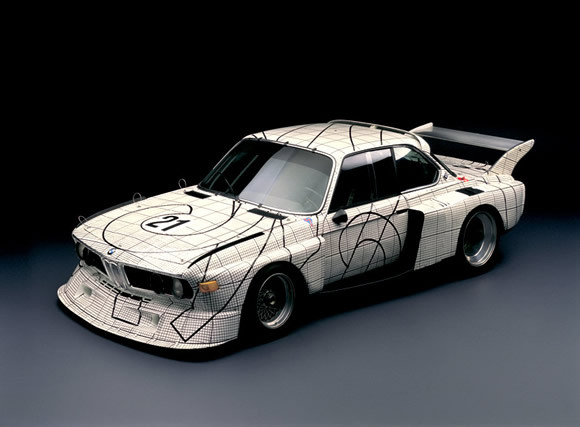 Read more about the car and Frank Stella here, the whole BMW Art Car Collection here and download the image as a background here.